The Appetizer on Blogspot: The Appetizer is Sponsored!!!! WOW, I never thought we'd get to this point, but I'm so happy and thankful that we have. When I started this thing 5 years ago, I dreamt of having an official sponsor for the show, and now that dream has come true. 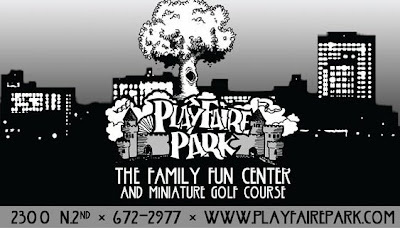 Anyhow, we are pleased to announce that the official sponsor of The Appetizer is Playfaire Park, the oldest continuously operated miniature golf course in Texas and one of the best venues for live music in West Texas. Be sure to visit Playfaire (voted best date spot in Abilene) for a great time at a low price and say thanks to Doc for supporting public radio, and listening to our program. We'll be talking about the bands and musicians who will be playing there in the near future.